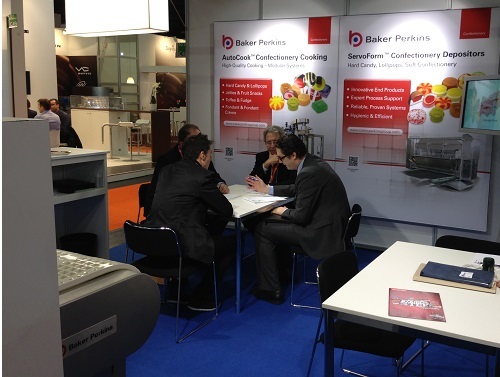 Baker Perkins highlighted its process and product innovation capability for the confectionery and snack ProSweets in Cologne, January 27 to 30, 2013 (Hall 10.1, Stand C-048). Baker Perkins is the market leader in cooking and depositing technology for the confectionery industry, and supplies equipment for extruded, co-extruded, baked and hot-air expanded snacks. Baker Perkins focused on the potential for new, high-quality deposited candies and lollipops. One shot ServoForm™ depositing systems combine up to four colours and components in a single piece. They offer greater product quality and variety, with lower production costs, compared with traditional methods such as die forming, starch mogul or cut and wrap. The latest ServoForm™ lollipop technology has the potential to generate an array of innovative high-quality flat lollipops. For the first time, interesting shapes, such as flowers and hearts, as well as the colours and patterns in the candy, can enhance the visual appeal of flat lollipops. Embossing the surface is another new way of increasing the interest and variety of round or shaped lollipops. The new capability brings character merchandising to the lollipop sector. Connections to movie, music and sports themes are possible in the product rather than just the packaging. Seasonal ideas, typically for Christmas, Halloween and Valentine’s Day, can also be pursued. A multi-headed depositing system is used for ‘long term’ three-layered hard candies with a genuine ‘sandwich’ appearance. ‘Long term’ layering involves a dwell time between each deposit, allowing the first level to partially set before the next one is deposited. This clear separation gives a true ‘layered’ effect, with different colours, textures and flavours: the most striking application is a sandwich of crystallized Xylitol between two layers of sugar-free hard candy. Centre-filled toffees, fondants and fudges are just some of the high value products that can be made on the new ServoForm™ Soft Confectionery depositor. Soft centres such as jam, cream, jelly, chocolate, praline and fruit paste can all be one-shot deposited to add value and variety to a product range. Two-component depositing can also be utilized to produce layered or striped soft confectionery, while solid inclusions such as nuts and fruit pieces can be added to broaden end product diversity. Where chocolate coating is required, the ServoForm™ depositor can be configured to discharge in a regimented format, ideal for direct-linking to in-line chocolate enrobing. Another innovation is a high added-value toffee cup, complete with filling and topping or inclusion. These indulgence products require a multi-headed depositor and flexible rubber mould technology - more economic, precise and hygienic than conventional processes. The first head deposits a toffee cup, the second a filling – fondant, praline, chocolate, jam and jelly are among the possibilities. A third head can add a topping such as chocolate, or inclusions including nut or fruit pieces. As well as product variety, consistent high-quality and low cost of production are reasons why depositing is chosen ahead of conventional methods. The nature of the depositing process creates great flexibility and process control. Dimensional, shape and weight accuracy are extremely high; fillings are accurately positioned in the centre; and scrap rates are minimal. Operational costs are also lower when compared with traditional processes. Set-up is quick and easy using a simple touch-screen interface with recipe-driven change management. Once running, the process requires very little operator intervention. An automatic wash cycle and hygienic design features minimize cleaning and changeover times for greater line efficiency. A new process makes a completely fresh range of extruded products using an innovative die that produces a thin, wide sheet of dough that is cut into regular, geometric shapes by an in-line rotary cutter. The shapes may be fried as a conventional snack, or baked to produce low-fat snacks. Another innovative process is continuous puffing of pellet snacks using hot air. Based on the proven Thermoglide2™ Toaster, the new snack puffing system replaces frying as a means of converting pellets into a finished snack. No oil is absorbed during the expansion process, unlike frying, and only the minimum amounts required for flavour need to be added afterwards. Extrusion is a much simpler and more economic process for manufacturing flavoured croutons than the conventional process based on mixing, forming and baking of bread dough. Extruded croutons have a light, crunchy texture that is ideal for snack products and compatible with a wide range of savoury flavours. As business expands, a line may be extended in stages to broaden the range of products that can be made to include both traditional and the new generation of healthy snacks. These can include a full portfolio of high specification, complex products including whole grain / multigrain and sweet or savoury filled pillows with intriguing shapes, textures and surface patterns; plus high added-value sticks, pillows, bars and bites in plain, shredded or filled forms.